If a noun begins with a vowel, then the article "an" is used. If it begins with a consonant, then "a" is used. This basic rule is fairly easy for ESL and EFL students to learn. However, the more difficult point to teach is that we need to look at the pronunciation, not the spelling of the word. For example, "Lunch lasts for an hour." "Hour" begins with a consonant, but in American English, the "h" is silent, so the beginning sound is a vowel sound. Another area students have problems with is in using initials or acronyms. For example, "Did you submit an RFP to the foundation?" Although "RFP" begins with a consonant, if I say the letter "R," it sounds like "ar". The beginning sound is a vowel sound. I find that lots of exercises or drills are useful for reinforcing this point. Also note, that I am assuming here that the difference between definite and indefinite articles has already been taught. I don’t know about other English-speaking countries, but in the U.S., this question means, “Have you watched the Harry Potter video or DVD on your television set yet.” We usually use “watched” when we are talking about a video. “Watched” is for movies on video and DVD. “Seen” is for movies at the theater. As an ESL tutor, it's part of my job to correct my English as a Second Language students when they make errors. I use my professional judgement about how often to correct students and what to correct them about. When my primary objective is to get students to speak, I might make less corrections than for other students. I don't want to discourage them from speaking by adding to their fear of making mistakes. However, as a native English speaker going about my daily activities, I never correct people who aren't native English speakers, UNLESS they ask me to. My ESL student was surprised at this and asked why. I couldn't tell him why we feel this way. I really don't know. It's probably a good idea to tell ESL students that if they want native speakers to correct them, they need to ask them to do so. Also, it's best to tell your students to not ask the native English speaker "why." Most of us don't know "why," we just know "how." I use several different textbooks and other resources for my private ESL students. You can see a list of the books I highly recommend for ESL teachers and tutors on my ESL Textbook Evaluation page. When I'm tutoring ESL students one-on-one , I draw from at least two or three different resources. I often have handouts for my ESL students. I make copies of various grammar points and exercises that I give them. Because I draw from different resources, I rarely recommend a particular grammar or textbook for them to buy. This allows me flexibility and saves the student money. However, I've found that my copying costs can add up over time. In any case, I never charge my students for copies I make for them. This is part of my cost of doing business, so I always save receipts and deduct this as a business expense on my tax return. "Tag questions" are one of the more difficult areas for ESL and EFL students. They know that you are asking a question, but the difficulty is in figuring out whether their answer should be a positive (yes) or a negative (no) answer. This is the first problem. Understanding intonation is the other difficult area of tag questions for ESL students. As most native English speakers know, when a tag question is used, it can be used in two ways: (1) when the speaker doesn't know the answer to the question and is asking for an answer, and (2) when the speaker is not really asking a question, but rather, is asking for agreement from the listener. For example, "It's a beautiful day, isn't it?" The speaker isn't really asking for a weather report, but rather, is making a comment and asking the speaker to agree with him or her. Whether the speaker asking a tag question is really asking a question or just asking for agreement is a matter of intonation (another difficult area for English language learners). If the tag question "goes up," then the speaker is really asking for an answer. If the tag question "goes down," then the speaker is asking for agreement. I find that after the basic above formulas are taught to my ESL students, then we really need to practice with drills in order for them to truly get it. Vocational English as a Second Language (VESL) is a form of English for Specific Purposes (ESP). VESL classes are offered by adult schools, trade schools, and non-profit organizations. The classes focus on English that is used in a specific vocation. For example, a non-profit may have a class for childcare givers, so the language and skills taught will center on the purpose of taking care of children. For ESL or EFL teachers, there may be some extra challenges involved because there is often a wide range of English language levels of the learners. However, positions teaching VESL can also be very rewarding. One thing that feels good about teaching VESL is that you know that the language being taught is highly useful. How to Use "Used to"
Not only can "used to" be used to talk about something in the past that is no longer true, but it is also used to talk about something that happened regularly in the past, but now no longer happens. I used to live in Los Angeles. They used to be married. Bill Clinton used to be the president of the U.S. They used to exercise at the YMCA. She used to watch TV every day. 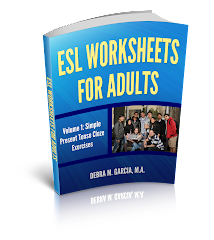 See Teaching ESL to Adults for more ESL teaching tips. Many of my ESL students are very advanced and primarily want to work on their speaking conversation skills. That means we have to find something to talk about. As the ESL teacher, it's my responsibility to introduce subjects, ask open-ended questions, and generally ensure that the ESL learner speaks. There is such a variety of ESL speakers, not only in terms of the range of English language skills, but in their inclination towards speaking. I have some advanced level ESL learners whose total speaking time during our sessions is significantly less than the total speaking time of some intermediate level students. My total speaking time is probably the same in both cases. The difference is that some advanced learners can tend to be perfectionists and spend significant time thinking about how to very correctly say what they want to say. In my ESL tutoring sessions with students who want to improve their speaking ability, I really try to come up with conversation topics that are of great interest (hopefully, there is even passion) to my students. The objective is to get students to talk, by any means necessary. If I have prepared a topic of conversation for the session and it doesn't seem to be productive, as a private ESL tutor, I can immediately change the subject. It's important for conversation classes to discuss what the student wants to discuss (or is willing to discuss) and not what the teacher wants to discuss. It's also important for the teacher to be quiet, even in those awkward silences! I was working with an advanced ESL student today. Her English is excellent. We are mostly concentrating on accent reduction and job interview questions. Today, we were working on past tense pronunciation using /t/, /d/, and /id/ sounds. Before teaching these three endings, I taught her about voiced and unvoiced (or voiceless) sounds. I feel that this concept needs to be taught before a student can fully grasp the past tense endings. My student told me that this concept of voicing was very helpful to her, and that out of over six English teachers she has had, no one has ever taught her this before. See Voiced and Unvoiced Sounds for more info about teaching this concept. When I teach my ESL students the use of “should” when offering advice or making suggestions, I always mention how it might be better to use “could” instead of “should” to soften the suggestion or advice. For some reason, most Americans hate to be told what we should do. Some of us have this internal flinch that happens when we’re told what we should do. Or, "You could practice your English every day," vs. "You should practice your English every day." When I was attending my TESOL certification course, I heard the word "lexis" in a different context. This word was used to represent the list of words that the ESL or EFL learner must be taught in order to fully understand significant parts of the lesson. For example, in doing a reading lesson, the teacher has to pick out the words that are essential to understanding the story and review these words before the student reads the reading passage. The ESL teacher's experience should help to guide him or her in deciding which words to pick out. The decision will be made based upon the level of the students, the teacher's knowledge about the students, and (here's the one where you'll always get it right) the words that the ESL/EFL teacher can see are necessary to understand the story. Don't worry if you find that the students already know the vocabulary. This makes it even easier. Just be sure to have your "lexis list" before the lesson and make sure that you can easily explain the definitions. I met with a potential new ESL student yesterday. I can usually tell a little bit about the level of potential students based on the email exchanges we have before our first meeting. Even when I get emails from very advanced level ESL students with absolute perfect grammar, I can still tell that they are English language learners. I've had a couple of students who are native English speakers but want to improve their writing skills. With this most recent potential student, I really wasn't sure what to expect. It turns out that this ESL student was indeed an ESL speaker. She has been living here in the U.S. for several years. Her speaking was excellent. She had an accent, but that was the only thing that let me know she was an ESL speaker. I tried to do my regular Needs Assessment to find out what her weaknesses were. It took quite a while to hear any problems. She answered all my questions very well. I started to hear a couple of problems with verb tenses, but no consistent problems or serious ones. As I asked various questions using different tenses, I finally heard what her problems were. The amazing thing was that she was able to maneuver around her English skills limitations. She was fluent and thoroughly grammatically correct with what she did say. However, for things she was unsure of, she just didn't use them. I think these are amazing ESL survival skills; to be able to speak so well that even an ESL tutor is slow to figure out the problems. One of the examples used to teach past tense pronunciation in Azar's Understanding and Using English Grammar is "He tooted his horn." I've found very, very few ESL students who know what this means. Of course, native English speakers know that this means that someone "honked" the horn of a vehicle, such as a car. Right here we have a vocabulary learning opportunity. And then, another learning opportunity comes along. What happens if I add "own" to the sentence? "He tooted his own horn." Now the meaning has totally changed and we are using an idiom. I often explain that this means for someone to "brag" about himself. Very few English language learners are familiar with the word "brag." Another learning opportunity. Of course, there has to be a balance between sticking to the original intention of the lesson and not getting too sidetracked. Fortunately, as a private ESL tutor, I'm able to monitor and keep track of this balance a little easier than I would be able to in a classroom. ESL teachers go round and round about the issue of talking slowly to ESL students. Some teachers think you should speak slowly and some don’t think you should slow down your speaking at all. I lean more towards the speaking-at-a-normal-pace side of the issue. With advanced ESL or EFL students, I think it is especially important for teachers to speak at a normal rate. When ESL learners are out in the real world, native-English speakers usually don’t slow down their speaking. So if I’m able to get my English language learners used to fast speaking, then I believe it benefits them when they are outside of class. I also make a point of teaching them the many reductions that native speakers use, so that they can figure out what the heck we are saying. For my beginning level students, I do tend to slow down my speaking more often, especially when I am explaining some English point. I tend to speak quicker when we are “just talking.” Of course, if the ESL student just can’t understand what I’m saying after a couple of tries, I will slow down my speaking. I tend to think that ESL teachers and tutors who always speak slowly and clearly to their students are actually doing a disservice to their students. ESL learners need to be prepared for how the “real world” (of native-English speakers) speaks. I think it’s helpful for them if they are able to practice their listening skills in a safe classroom or tutoring session. I love when teaching opportunities present themselves during my ESL tutoring sessions; especially when the opportunity allows me to teach something that goes beyond regular grammar. When teaching Past Tense pronunciation for regular verbs to ESL students, I often use a worksheet from Azar's Understanding and Using English Grammar . In a list of Past Tense verbs, they have the word "loaded." Of course, in this context, "loaded" is the past tense of the verb "load." I always ask students if they know what this word means. Every single student I've asked tells me the correct definition of the verb "to load." I then ask if they know of any definitions for the word as an adjective not related to "to load." No one ever knows. Do you? I often help my ESL students prepare for job interviews. I usually give my students a list of the most common interview questions and then we practice the answers during our sessions together. One of the interesting points is how a slight accent can actually be an advantage. A thick accent will often work against someone in a job interview. The article also says that accents trigger emotional responses in us. At the same time, 'Be careful how you use the English language,' Markley cautions. 'Be sure to use good grammar. Speak slowly. Don't get frustrated if you have to repeat yourself. There's plenty of stress in job seeking. Don't add more by worrying about your accent.'" 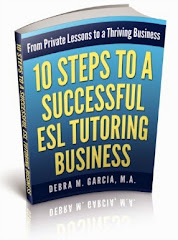 As a private ESL tutor, I have to think about multiple sources of income. Since I choose to teach no more than three students a day, I really have to think about other sources of income. Currently, my two other sources are my websites (one about cats and one about ESL) and editing. I don’t do editing regularly, but it seems that I frequently get emails from people in response to my craiglist’s ads for tutoring services. Many people have written me since I started posting the ads asking me if I can edit their papers. If there is a reasonable turn-around time and reasonable compensation, I usually take the editing job. I refuse to take on someone else’s headache who has waited until the last minute to finish their paper. I’ve had enough headaches of my own over my years as a student! The main function of the Present Perfect Progressive is to emphasize the duration of something that started in the past and is still going on. For example, "She has been teaching ESL for six years" or "I have been waiting for you for forty-five minutes! The Present Perfect Progressive (also called the Present Perfect Continuous) is also used to talk about something that has been happening recently. For example, "They have been thinking about taking a vacation" or "Lately, I've been meeting my English students at the library." For more info on using this tense to talk about things that have been happening recently or lately, see Present Perfect Continuous Forms. Perhaps one of the basic life skills ESL students need to learn is how to complain. After all, some say it's the American way! In fact, there are many valid reasons to complain and everyone should know how to complain, especially when he or she is taken advantage of by a merchant. Teaching ESL students how to effectively complain in such situations is a bit more complex. However, teaching ESL students how to complain the every day way is a bit more simple. If the English language learner knows how to use the Present Progressive or the Past Progressive, then he or she knows how to complain! All you have to do is teach them to use the word "always" with a progressive tense. John is always leaving the toilet seat up! Mary and Mark are always talking during class. We were always arguing, so we got a divorce. Using "always" with a progressive tense expresses anger or annoyance with the situation. I could also say, "John always leaves the toilet seat up." Using the Simple Present tense expresses his habit, and perhaps, it expresses my annoyance. However, using the Present Progressive in this situation clearly expresses my annoyance. "I am Jung. I call you to ask ...." This is a typical beginning of a voice mail left for me by many of my students. This sounds strange to any native speaker. We know that we say, "This is Jung." And then we most likely use a Present Progressive follow up. Identifying oneself is such a basic telephone skill that I often forget to teach this to my ESL students. It's usually not until a get a message like this, or a phone call, from one of my students that I remember to teach this basic telephone skill. And since many ESL speakers feel uncomfortable using the phone, most of my communication with my students is through email. Identifying oneself and other basic telephone skills should be a part of the basic survival skills we teach our ESL students. I came across another ESL-related joke today. Q: What's the difference between a large pizza and an ESL teacher? Do you have any ESL related jokes? I'd love to hear them. You can send them to me at the email link on the right of this page, or submit them through the comments link. Here's the text of the most recent scam response I received from my ESL advertisement on craigslist.org. As I've mentioned before, I always receive at least one of these scam responses whenever I post a new ad. The title of the email to me was "Good Day Teacher.........."
Here's the text of the email. The email address was thompsjoel@gmail.com. Don't waste your time on these guys! Several weeks ago, I wrote about scams through craigslist.org. Advertising on craigslist is the main way I find new students. I keep one to three different ads running almost at all times. Ads expire after about a week, so I have to keep on top of it and repost my ads when they expire. The point here is that the scammers are persistent and will probably continue to try to scam unsuspecting ESL tutors and other teachers. So please be on the lookout and if the contents of an inquiry to you are similar to what I've written about in my other "scams" post, be careful not to waste too much time figuring out if the inquiry is legit or not.